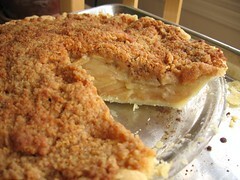 Flag-Raising Apple Pie - Do You Know The Muffin Man? Notes: The crust (butter and shortening) is easy to work with, but the quantity is barely enough to line a 9" pie plate. I used a mix of Northern Spy and Fortune apples; the latter are called Longo's apple at Longo's (?). For the streusel topping, I replaced almost all of the sugars with leftover pecan praline that I food-processed into a sandy consistency. Finally (after several recent disappointments), an apple pie that I enjoyed eating: a little too tart (needs a bit more sugar), but the apple flavour came through, and the nutty topping is delicious.